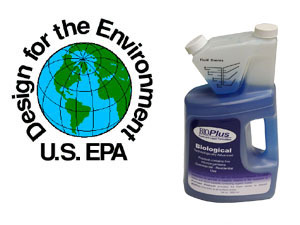 BIOPlus is a Biological Bacterial Agent that was formulated in partnership with the U.S. EPA “Design for the Environment”. It delivers exceptional bacterial activity with growth to speed the breakdown and digestion of fats, proteins, carbohydrates and petroleum hydrocarbons. The multi strains of microbes in BIOPlus begin to work immediately when introduced to an organic food source. There is no germination time required as with spores and the patented microbes can work with or without oxygen. These unique microbes literally eat, consume, and digest oil, grease and organic matter, converting it into carbon dioxide and water. Use BIOPlus wherever the threat of organic waste collects and exits such as cracks, crevices and septic systems. Even poorly grouted washroom floors have voids trapping odor and other contaminates. BIOPlus microbes contain no chemicals, no fillers, no perfumes, no emulsifiers, no enzymes, no seeds, no spores, and no pathogens. There is no mixing, no waiting, and best of all no clean up time. BIOPlus microbes are patented, all natural, live vegetative, environmentally safe, State-of-the-Art, next generation performance based product, that really and truly works. It is simply the right thing to do! 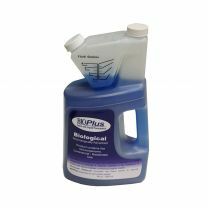 BIOPlus will achieve maximum performance when used with NPD’s ProFoam Platinum Foaming Agent and NPD’s Application Equipment which provide the foam carrier process to effectively deposit BIOPlus Microbes to all surfaces.